Enpixel buttons pack is the #1 professional and advanced pure CSS buttons script on the digital market (All in one solution). Enpixel buttons pack is the #1 professional and advanced pure CSS buttons script on the digital market (All in one solution). Modern, advanced, multipurpose, lightweight and ultra-responsive design ensures, Enpixel buttons are working perfectly on all devices, quick load on all browsers and suitable for countless purposes. Enpixel buttons designed using pure HTML5 and CSS3 languages, therefore it brings superior and modern look to the web applications. Enpixel buttons can easily integrate with most popular frameworks like HTML5, bootstrap, WordPress, Joomla Drupal and Blogger. In addition, Enpixel buttons can be used with material design and bootstrap projects. And most importantly with landing pages and portfolio projects. Not only that, Enpixel buttons can be used for blog posts, sales pages, subscribe forms, contact forms and everywhere on your website to get the maximum attention from your daily site visitors. A good call to action button help your business to get more subscribers, product orders etc. Call to action button is the main gateway for any type of digital businesses and personal websites to increasing conversions on web pages, therefore clickable and eye catching Enpixel buttons help your businesses and personal websites to get more subscribers day by day. The biggest Enpixel package comes with 4 different button versions, 2 different button styles, 10 different button shapes, eight different color editions and consist of 96 pre-defined HD retina ready colors and 5760 Enpixel buttons. This will ensures crystal-clear colorful look and plenty of button sizes to use for any purpose. Enpixel script allows you to customize your very own button sizes, text sizes and fa icons. 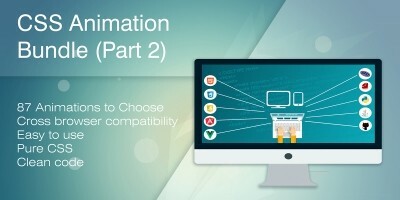 Not only that, Enpixel buttons has CSS3 animation framework, which is attractive and more powerful. In addition, Font awesome icon rotation animation brings an active look for the buttons. Enpixel package comes with a bonus package, this includes promotional banner boxes (This promotional bonus kit will help you to display eye catching promotional boxes on your web applications and it will easy the process of marketing), Enpixel smart tooltips, extra animations pack, icon cheat code sheet, and extra color cheat sheet. Enpixel buttons designed to provide maximum user experience on your web applications and eye-catching design grab the user’s attention quickly. Enpixel Buttons - This is the only button script, which provides all in one solution upon one time installation. Why Enpixel Buttons Are Different From General Buttons? Enpixel buttons are pre-defined and designed for use multipurpose. You can use these buttons as link buttons, check demo and download now buttons, check demo and buy now buttons, next and previous buttons, request quote or hire us buttons, note box buttons, contact us and support forum buttons, subscribe now and clear buttons. Not only that you can create view portfolio and load more buttons, read more buttons, ask a question buttons, about us buttons, search buttons and much more. You can use Enpixel buttons for countless purposes. You only need one time installation on your site, and then you can reuse these buttons for any purpose by adding couple of HTML classes. When you need a note box, you just only need to do is change the button text into your note. Then the button will transform into an eye catching and modern note box less than a second. Same process applies to display download and demo buttons, next and previous buttons and etc. Why Enpixel buttons are more useful and more powerful? Enpixel buttons package is suitable for any type of project and it is easy to integrate with any kind of platform. Unseen colors and color patterns are designed using CSS gradients. Solid colors modernized to bring a high definition look. Enpixel buttons text are crystal-clear, which ensures easy to read and clearly visible on any type of background. All above facts ensure Enpixel buttons has many differences in comparing with other button scripts. Moreover, you have all the freedom to control what styles you need and not. For example, you can decide whether animation need or not, tooltip need or not and with icons or without icons. Special Note - There are 4 different button versions, each version has button pack (12 HD colors + 6 sizes + 2 styles (Square and round) + 144 buttons) and all color edition has 96 pre-defined colors. All versions includes 5760 pure CSS Enpixel buttons. Enpixel buttons comes with 4 different versions, all versions has 10 different button shapes. This includes, square and round button shapes, side border square and round button shapes, single border square and round buttons shapes and etc. Different Uses of Enpixel Buttons. Enpixel buttons designed for use multipurpose, therefore it easy to create different buttons with Enpixel. Upon one time installation, you can reuse installed buttons for various purposes. For example, you add red and green color buttons to your website (Purpose of adding Prev Article! and Next Article! buttons), and then you can reuse those buttons for create demo and download buttons, next and previous buttons, note boxes etc. You only need to change button texts and icons. Note boxes. (Transform Enpixel buttons as note boxes). Transform your Enpixel buttons less than 10 seconds to create amazing note boxes with eye-catching colors (You never seen before). Just write your notes instead of button text, and then you will get ultra-responsive and colorful note boxes. Font awesome icons and animation hovers brings superior attention to the buttons (Animation will not affect to the user readiness). Any length note can be add to the button text area (It will not affect to responsiveness and no scroll or side cut on the screen). Selectable and customizable options of Enpixel buttons. Button style - You can select your preferred button style (Square and Round). Button size - It easy to create custom buttons sizes (Normal-width buttons and full-width buttons). Button font size - You can alter button font size according to custom size buttons. Font awesome icon type - You can add any font awesome icon to the buttons. Font awesome icon direction - Left or right. Button animation - You can add or remove button animation for specific buttons. All above selectable and customizable options are available with Enpixel buttons, and help guidelines provided together with codes (Well-commented codes). All customizable options only takes less than 30 seconds. In addition, installation takes less than 2 minutes. Within 2 minutes, you can run your buttons on your destination website. Pure CSS3 Extra Animations Pack. You will get 5 extra animations with Enpixel package, and you can select your preferred animation among bonus animations. Font Awesome Icons Cheat Code Sheet. You will get most wanted font awesome icons cheat code sheet. This will help you to add your required icons to the Enpixel buttons. Extra Color Cheat Code Sheet. You will get extra color cheat code sheet for customizing the Enpixel promotional box. Enpixel promotional boxes are very useful for marketing purposes and display Enpixel buttons more effectively and creatively. 100% ultra-responsive (Work in all devices). Smart main title wrap (Main title with font awesome icons). Promotional title wrap (Big Promotional Banner Texts). Sub heading (This is useful for display sub topics, paragraphs and as a footer). Smart line (This will brings user’s attention quickly. Pure CSS line). Smart buttons tooltip (This belongs to Enpixel buttons and useful for demo and download buttons). Background images or background colors (It easy to add background image or background color). It easy to create unlimited promotional boxes with different images or background colors by creating new classes. Promotional heading font sizes - You can use your preferred font size instead of predefined size. Promotional heading background colors - You can use any color (Additional color file provided). Promotional box background - You can add images or can use solid colors. All codes are well commented and very easy to understand, also comes with a simplified user manual. 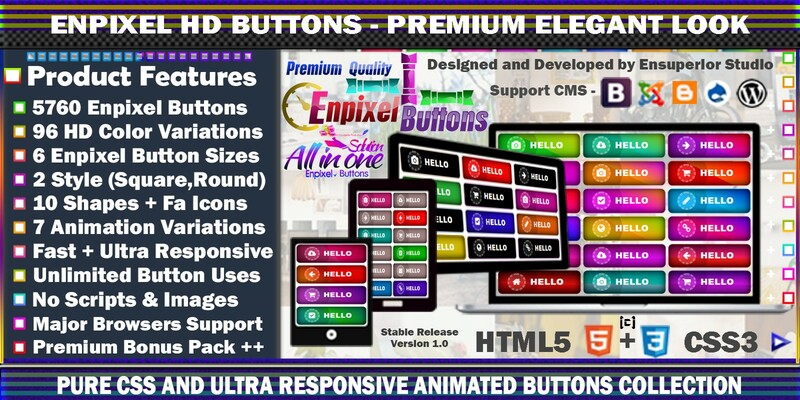 All Enpixel button versions and bonus package included in separate folders for ease of use. Easy to implement on any platform (Anyone can easily install). One installation allows more possibilities. Such as adding note boxes, demo and download buttons and etc. W3C and CSS lint validated, which certify all codes are clean and according to the industry standards. Enpixel buttons are working on apple safari, Mozilla Firefox, opera mini, internet explorer and Google chrome browsers. (Pre-tested and working smoothly on all major browsers). 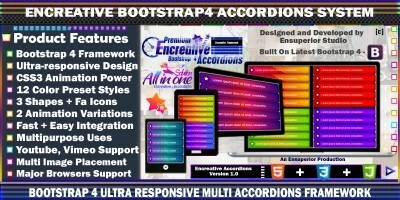 In addition, CSS gradients are working on all major browsers including mobile and tablet browsers. Oldest browsers display solid colors (Instead of CSS gradients) without affecting to the button styles. Detailed User Manual of Enpixel Buttons. Enpixel user manual designed to give systematic (Step-by-step) instructions on installing buttons on different web platforms (WordPress, blogger and bootstrap). In addition, this guide includes examples on how to install buttons on various platforms successfully without facing to errors. Moreover, frequently ask question section added inside the user manual. What includes in the Enpixel Package? Enpixel Buttons (5760 Enpixel buttons with 96 HD retina ready colors). Enpixel Example Edition (Pre created example buttons). Detailed User Manual + Frequently Ask Questions (FAQ) section with answers. What includes in the Enpixel Bonus Package? Enpixel promotional boxes with its all styles (3 pre-created promotional boxes). Enpixel buttons smart tooltip (10 color smart tooltips). 5 extra bonus animation pack (This includes 5 pre-defined animated styles). Font awesome icons cheat code sheet (Most wanted icons, you can easily copy paste icon codes to Enpixel buttons). Extra color cheat code sheet for promotional box custom decorations. Something you should know about Enpixel Buttons! 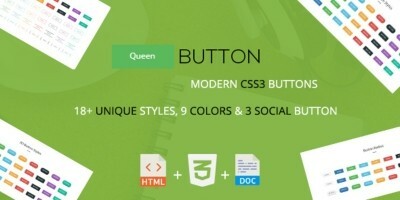 This is an independent buttons script (Based on CSS3 and HTML5). Icons are font based (Font awesome free icons). All animations are pure CSS3. This product comes with a proper user documentation (Simplified user manual), and we are always here to support you regarding this product. You can directly contact us through our official mail address and we will back to you within 24 hours with a solution. We are ready to provide top-notch professional customer support service. Font awesome free icons used to develop the Enpixel buttons script. Font awesome is a font based icon system that will help users to add different types of useful icons for their projects. All in one solution (Unlimited possibilities). Modern crystal-clear look (HD and Retina Ready). User friendly design and easy to create custom buttons less than a minute. It is very easy to integrate with any web platform. 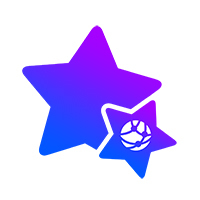 4 different button versions (Default, side border, single border and smart shapes). 2 styles (Square buttons and round buttons). 6 button sizes. (Square buttons and round buttons). 96 HD color variations (48 CSS gradient colors and 48 CSS solid colors). Color combinations are possible. E.g. red and green, green and red, and etc. Buttons color hovers and focuses effects. Different font sizes (It easy to change text size separately in all buttons). Pure CSS buttons animation hover effect (Smart animation effects). Font awesome icons support (Easy to change icon directions). Pure CSS font awesome icon hover animation effect (Flip side). Full width buttons (It easy to create specific full width buttons within second). Enpixel buttons support for 'a', 'div' and 'button' classes. In addition, you can create submit and clear text buttons using “button” classes. Enpixel button icons not defined in the CSS codes; therefore, you can add any type of icon to the HTML codes when pasting buttons on your website. 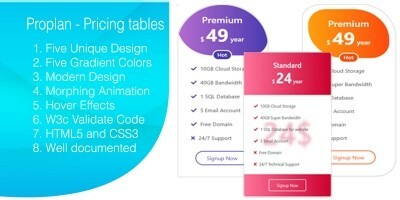 Advanced CSS3 design (This ensures, Enpixel button styles are not change on custom designed themes, such as bootstrap themes and WordPress themes). Button texts are clearly visible in all edition colors (Crystal-clear texts). Smart tooltips (10 colors with smart icons). Major browsers are support (Safari, Chrome, Firefox, Opera, Internet Explorer). Buttons installation can be done less than 2 minutes. Minified codes for faster loading - But all the customizable option codes take into front of each customizable sections, therefore it easy to customize. Customizable all options can be customize less than 30 seconds.